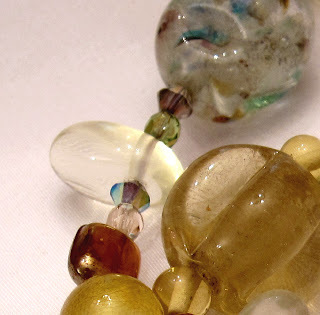 A short post to mark my coming back to the world of blogging... And the creation of another necklace after a long hiatus. During this time I've been struggling to stay awake (with not much success so far! ), been to Rio and back, and not much more. Except for pampering our little Bella more and more every day. I made this necklace as my Mother requested. 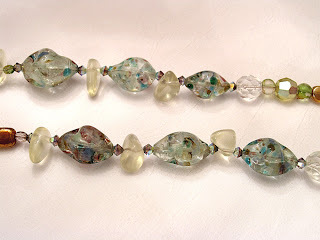 She had a long Murano lariat that broke. She gathered the beads and sent them to me, asking me to do "something" about it. 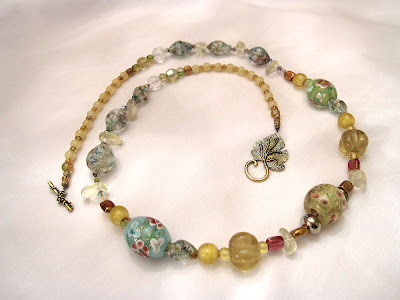 I decided to make a new, longer necklace and reuse most of the beads, also adding some new elements, such as: Swarovski crystals (essential, in my opinion), Brazilian lemon quartz pebble and lantern-shaped beads, small round yellow jade beads, and three fabulous tonbodama, by Naomi, a very skillful Japanese bead artist. My aim was to give these tonbodama a new "home" and I thought they would get along really fine with my Mother's original beads. Tonbodama are exquisite glass beads that combine different types of coloured glass and can be inlaid with several delicate patterns. 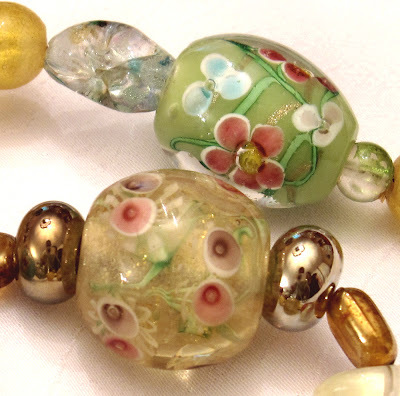 In Japanese the word tombodama literally means "Dragonfly bead", as they seem to display the colours and reflections of a dragonfly eyes: 蜻蛉 (tonbo) meaning "dragonfly" and 玉 (dama) meaning "sphere, ball". 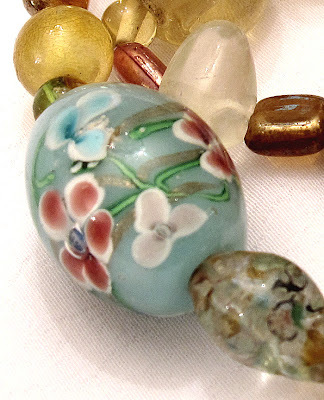 The art of glass beading was introduced in Japan around the 3rd-4th centuries AD, from the Eastern Mediterranean via the Silk Road (mostly China and Korea). 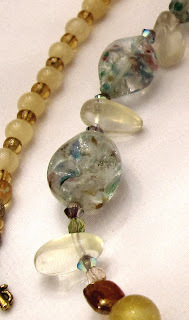 Below, a detailed view of the lovely lemon quartz pebble beads, and the lantern-shaped ones - which I am not 100% sure are lemon quartz, but certainly some kind of quartz/crystal. 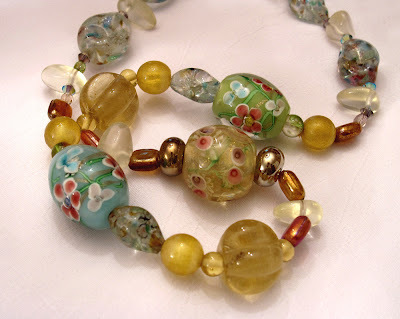 The tonbodama are these beautiful big round beads in green, yellow and blue with inlaid flowers and roses and swirly golden patterns. Below, they can be seen in more detail... I absolutely adore them. Again, the lovely transparent Muranos, some Czech faceted crystals, lemon quartz and Swarovski elements... 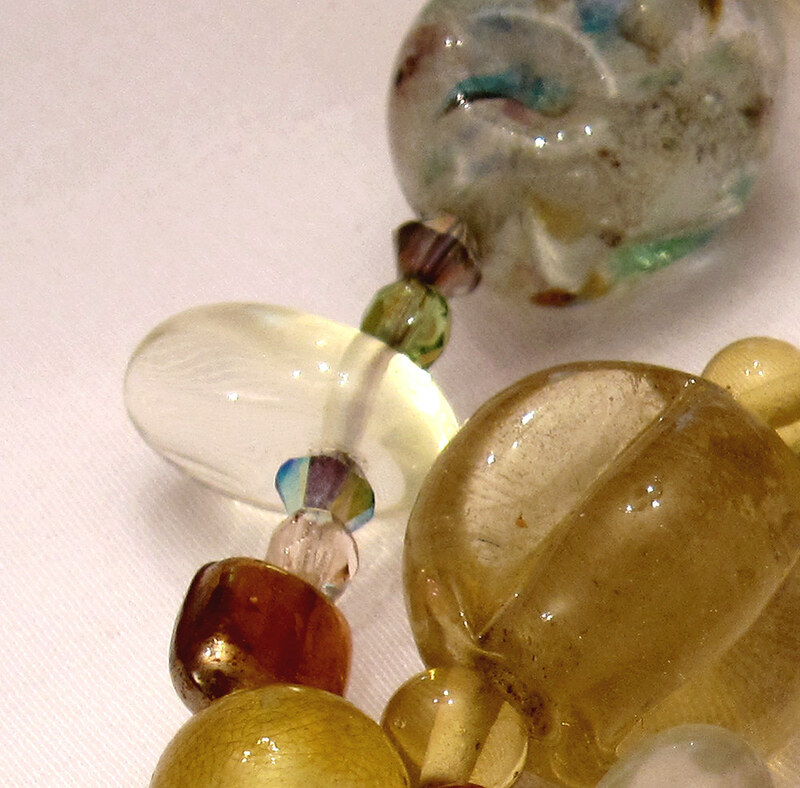 The Muranos look quite old and battered but are still shiny and bring a lovely vintage flair to the piece, coordinating well with the tonbodama and lemon quartz. I'm so happy to have you here again. "I absolutely adore them" I do adore them too! The pale blue, green, and yellow tombodamas and the color combination of the necklace beautifully represent summer(natsu). I'm so glad to know that Bella is fine. The neclace Bella is awesome. It is very stylish and lovely. 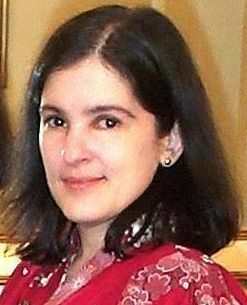 Thank you for sharing all these, Andrea. The product was a which u have mention.I think these are the most valuable post discus through this blog. so necklace beautifully It is very stylish and lovely. Thank you for sharing all these.